Do you remember when The Spectacular Spider-Man was still an ongoing title? It was filled with mostly B-list villains and plots that never touched the mainstream Spidey-verse (unless they were tie-ins like "Maximum Carnage"). 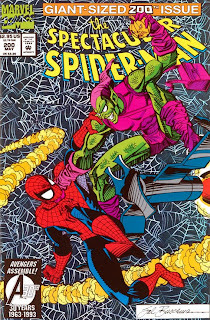 It also was a consistent book to go to for one's Green Goblin fill. I'm talking back when Norman was still dead and Harry was still crazy. Harry Osborn was the second green aerial-gliding menace, following in the footsteps of his father Norman Osborn. Not only did Harry have daddy issues, but he also went bipolar once he came in contact with pop's goblin serum. For years Harry tormented Peter, his best friend, because he blamed Spidey/Peter for his father's death. All of his rage for Peter came to a head in The Spectacular Spider-Man #200. 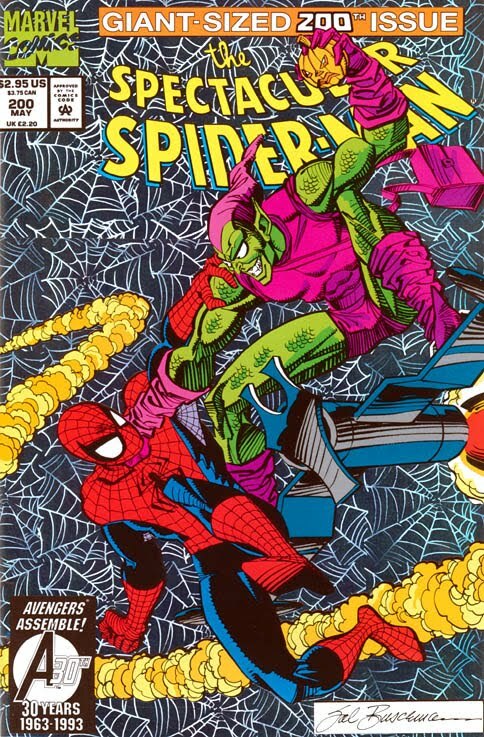 In this "Giant-Sized 200th Issue", the Green Goblin basically follows Peter all over town baiting Peter to fight him and do something he'll regret. Harry wants to see Peter's seemingly happy life be filled with chaos and destruction just like Harry's was for so long. In an attempt to finally kill Peter and himself in suicide by building demolition (the most common way to kill your self in 1993), Harry nearly kills Mary Jane (they're old pals) and his son, Norman (named after his father...how sweet). Harry ends up saving Mary Jane and his son and then Spidey himself once he realizes family and friends are worth living for. Oh, but right after Harry saves the people he almost murdered he drops dead himself due to the toxins in the Goblin serum. Death by building would have been cooler. The issue has an overload on emotion. Sal Buscema pencils so many panels of raged out faces. The consecutive panels of Harry are the best because in one panel Harry will look wacked-out crazy with anger and then the next he will have a puppy-dog sad face. The issue is really the tour de force of facial expressions (tour de force...don't know if I used that correctly). Every comic of the day needs a puppy-dog face, and The Spectacular Spider-Man #200 has it!